In the midst of living your vocation did you ever wonder what became of some of your college classmates? Since graduating in 1992 I have been continually surprised at how fellow Franciscan University alums have popped up on the radar — locally and nationally. Seeing Regina Doman’s books on the shelf of a local Catholic bookstore (and having the owner clearly impressed that I “knew” her from college); reading about Peter Murphy’s new position with the USCCB; watching Fox News one night and seeing a very familiar face in clerics… hey, wait a minute! I plowed that guy over in flag football when SAB played FUSA back in ’91! And now he’s a priest!? (I wonder if I need to confess that — sorry, Jonathon…I mean, Fr. Morris). Between scrapping petrified boogers off the wall near “time out”, homeschooling the kids, and working with our parish Respect Life Ministry I found myself at a doctor’s office with a sinus infection (another reminder of FUSJ). Looking for something to read while waiting I noticed a Catholic family magazine on the table. Flipping through the pages I saw a face I knew. Where had I seen him? On TV? No. Catholic conference of some kind? No. Good gravy! I sat next to that guy in English back in college… and now he’s an author. John Coleman was now John McNichol and had authored a book aimed at teenage boys. How convenient, I now had two of those (teenage boys). My eldest son read and loved John’s book – and my oldest is not the kind of kid who reads for fun. He begged for the sequel and this fall got his wish. 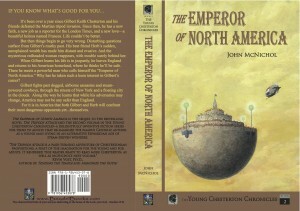 The Emperor of North America, John’s sequel to the popular Catholic historical Sci-Fi The Tripods Attack! hit stores and Amazon just weeks ago. I asked John to do an interview for his fellow Franciscan alums. Kay Anne Kelly: Please give me a brief overview of your first book, The Tripods Attack! What inspired you to begin writing the Young Chesterton Chronicles? John McNichol: Inspiration for the book came from several sources, namely my family, my life and my students. As a middle school teacher, I saw quite a few of my students doing book reports on novels whose plots ranged from weird to asinine. Moreover, I too-often found that characters of a more secular, liberal outlook were depicted as noble, competent and compassionate, while characters with anything approaching the Catholic worldview could be cruelly and unfairly caricatured as vicious, cruel and evil, stamping out people’s joy without even any sympathetic motives, but just for the heck of it. Added to that, my own sons were getting older. I was looking for quality reading material for them to both learn from and enjoy. Unfortunately, a significant amount of secular literature for middle-to-high school boys had the abovementioned problems, and a lot of the new Catholic fiction seemed aimed squarely at girls. I wanted to find an adventure series that guys would find exciting and enjoyable, and would show the Catholic worldview for the truly heroic effect it has had on human history. I also wanted to realistically depict the deleterious effect that secular humanism has had, from the Reign of Terror to the current Abortion holocaust. Most of all, I wanted to introduce a generation of young people to the writings of GK Chesterton, a real-life Catholic writer who looked at life as an adventure to be celebrated, and wrote with an air of a swashbuckler fighting pirates in the rigging of a tall ship. Making him the hero of an exciting series of novels seemed too good an idea to pass up, once it jumped into my head. Kay Anne: How did attending FUS impact your writing? John: It’s funny you should ask that, because I only completed one short story in all four years of college! Still, I began writing many pieces that weren’t finished, and even designed some board, card and strategy games with Catholic themes. Being around positive people, fellow students who loved their faith, was indispensible. So was finding people who enjoyed the same genres of literature I did, but shone Catholic-themed lights through them. One household brother loved comics, and introduced me to a Catholic superhero named Nightcrawler. Another showed me a fantasy book series by author Stephen R. Lawhead in which the characters believably embrace Christianity, leave paganism behind, and make the world better for it. A third had what looked at first to be a Heavy-Metal-type t-shirt, but at closer inspection was revealed to be a stylized St. Michael crushing the head of Satan. Amazing, to me, back then. Amazing, inspiring and galvanizing, that religious faith could be so positively portrayed in formats better known for their hostility to authentic Catholicism. Plus, considering the basis in the faith I received there, it’s really quite difficult to overestimate the impact that FUS had on virtually every part of my life after college. With regards to my writing, the professors at the English department taught me a great deal on how to analyze a literary work and see how it conveyed its message to readers. I also managed to catch a love of Literature and the poetry of many different periods of history. Most important, during my Junior year I really started to click with the idea of the arts, of good art being a reflection of God’s truth. Kay Anne: Your characters are intricate and layered — many are also based on real people. What made you choose this avenue for telling this story? John: I did it in part because GK Chesterton has been unfairly scoured from the literary canon, and I wanted the reader to be exposed to his writings and thoughts. What better way to do that than put him in an adventure where he has to put all the theories of the Church into actual practice? As for multilayered characters, it’s important to remember that people rarely have what they see as truly evil motivations for what they do, even if they are doing truly evil things. In my own experience, most people who do bad things are terribly broken or misguided. Characters written for older audiences ought to have motivations that make sense, at least to them. In the YCC, Herb Wells has been taught that religion is bosh and only the secular life can bring true freedom. He’s also been taught (as all proper ‘science’ taught back then) that most races are inferior to the white European. He does have an evil philosophy, but Herb himself doesn’t see it that way. So much so that someone like Herb has to get a shock on the level of having his life threatened by aliens to really see the folly of his worldview. What has proven odd for me is how sometimes the truth has been stranger than fiction. More than once now, I’ve found that long after I’ve decided to place together certain historical figures in my stories, they’ve turned out to have had connections in real life as well. Kay Anne: Did you have any professors who were particularly helpful or inspiring in regards to your writing? John: Yes. Mr. Englert had a love of Shakespeare so profound that I still hear his voice in my head when I read the Bard. The idea of the good man and friend who feels powerless to turn from evil once he starts down the road to perdition is one theme from Shakespeare I’ve worked into my stories. The person whose life is changed by a near-lucid dream that may-or-may not have been real is another. Dr. Stephen Krason was the first example I had at the University level of someone who found and reinforced the truth of the Catholic faith via an insightful, rational intellectual process. Mr. Doherty encouraged me as an amateur actor to channel memories and feelings in ways that would make my stories accessible to audiences, either from a stage or printed novels. But it was truly Dr. John Holmes who made the biggest difference for me. He had a talent for making even the most intimidating texts very accessible, and his enjoyment of literature was infectious. It was in his class while reading Browning’s Pippa Passes that the notion of Christocentric literature truly took hold in my head. It may sound terribly naïve, but up until then I had a separation in my mind between books I enjoyed and books that would edify me spiritually. Something shifted inside me while we discussed the story of a girl who enjoys one day off a year with song-filled joyfulness, whose song brings happiness to the good and the evil to justice without her knowledge. I saw that there didn’t have to be an either/or in my reading. Something could be both enjoyable and beneficial to my soul. Yeah. It took me until Junior year. I was kind’ve a thick soul. Kay Anne: Reading each book, maybe more so in the second, I could not help but detect the strong life ethic being put forth by the main character, Gilbert. How do pro-life beliefs get woven into a historical/sci-fi work in a manner that does not appear forced or contrived? John: I’m very glad that came through. In a work of historical fiction, one can illustrate a truth of the human condition by using previous examples from our history. Slavery, for example, was the chief issue of the 19th century, and the cause of the Civil War- the inaugural statement of the first and only Vice President of the Confederacy proves that beyond a doubt. And Slavery can be used to illustrate a pro-life lesson precisely because of slavery’s similarity to the abortion and euthanasia issues of our day. All said issues are about the inherent worth and dignity of the human person, regardless of their geography or usefulness to those in power. Thus, if you have characters talking about slavery, you’re going to see a number of parallels in the issues in their conversations to the modern issues of human life concerns. As a writer, I’ve found that my convictions and experiences naturally flow into the conversations of my characters. I’ve worked in more than one argument I’ve had with a pro-abortion choicer outside an abortuary into the conversations between the characters of Father Brown and the Doctor, for example. Usually in a story, though, if you’re going to have characters argue, it’s best to keep it short, make sure the conversation is honest, give the good guys the last word, and end the argument with a rip-roaring action sequence. Far better for someone like Herb to realize on his own that the law of the jungle only looks good when you think you’re one of the lions! Kay Anne: Did your experiences as a student at FUS help develop any of the scenes in the YCC series? John: Boy, that’s a good one. The simple answer is: yes, most assuredly. I put rough renditions of events either I, or other people I knew well, went through during my student days. Gilbert, for example, has to make choices between the world and God, and almost every Christian has to do that in ways big and small every day. I saw a number of people in my time at FUS make heroic struggles for virtue, overcoming very difficult temptations and trials in their lives. Many of these people are still not aware what amazing inspirations they were to me. Others made poorer choices, often for reasons that seemed rational to them at the time. What made them (and still does make them!) heroes in my eyes was not that they fell, but that they realized their error and kept getting back up again and again. 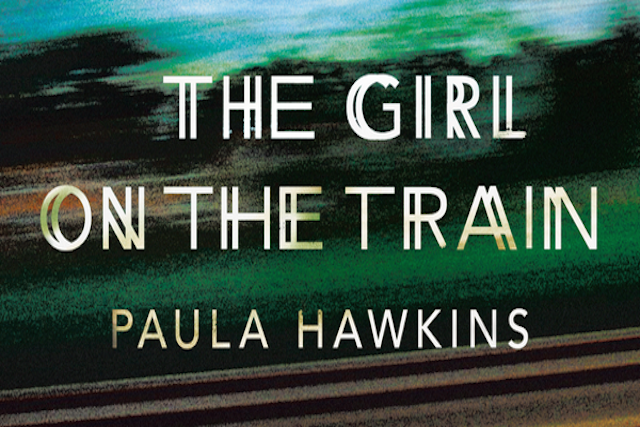 Kay Anne: What do you want readers of any age to take with them after finishing your books? Is there a third book in the works? John: The biggest message I’d like them to take from the whole series is that your worth and dignity comes, not from what you can do or contribute, but from the fact that God made you. It’s truly impossible for any society to establish authentic justice or avoid tyranny without that belief. There is definitely a third volume in the works. I am half way through its first draft, tentatively titled Where the Red Sands Fly. Gilbert this time travels to Mars to finally confront the Doctor and untangle the web of his life. I also introduce a new character, a young army officer based on Chesterton’s real-life, feisty friend named Hilaire Belloc. I don’t consciously try to name a theme for each book- it more grows spontaneously as I write, and I develop it in the rewrites. Tripods introduced the characters and the clash of Catholic dignity vs. secular bullying worldviews, and Emperor shows how a life lived for God is the most rewarding one, though fraught with temptations, stumbles, falls and risings. In Where the Red Sands Fly, the characters face a challenge I’ve seen in more than one Catholic media figure fall to over the years: how success tends to make one cherish their independence, so much so that God is slowly and subtly pushed out of the picture, and it often takes a smack upside the head (symbolic or real!) to get us back on track again. And so, some classmates are authors of adventure filled historical sci-fi books while the most exciting thing I did today was get buy one, get one free on Lysol kitchen cleaner at the grocery store – each thrilling in their own right. John’s skills as a writer were developed, encouraged and nurtured at FUS and my booger removing abilities were enhanced by either Mr. Bessler or the two years of my SWOP job in dorm custodial — take your pick (oh, that was bad… sorry). The blessing of a solid Catholic education reaches through our vocations and impacts anyone within our influence. I enjoy thinking about the accomplishments of fellow FUS graduates. The ones I still know and work with who help lead our parish teens (Courtney Desmond – Youth Minister – FUS grad ‘05) and adults (Patrick Klein – Head of Adult Religious Ed – FUS Grad ‘04) to Christ, the ones I see on TV when I am folding the laundry, the ones I see on the bookshelves of my local Catholic bookstore, the ones who volunteer tirelessly for parish ministries (Dave & Julie McLaughlin – FUS grads –’90), and those in the secular workplace or domestic frontier, like my husband and me (class of ’92). Mother Teresa rightly stated, “It is not how much we do, but how much love we put in the doing.” But even Mother T wouldn’t scold when one of us lesser known grads happens to name drop — there is nothing wrong in being proud of the faith filled accomplishments of the numerous FUS grads. It is a legacy of Catholic leadership we bring to the workplace, home front and the world. And isn’t that why we went there? John McNichol was born in Toronto, Canada in 1970, lived the first eighteen years of his life in Toronto, and left to attend college at Franciscan University in Ohio. There he met his American wife, and has remained a resident of the United States since his graduation and wedding in 1992. John now lives in Vancouver, Washington, where he and his wife Jeanna live with their seven children and The Dumbest Dog In The State Of Washington. 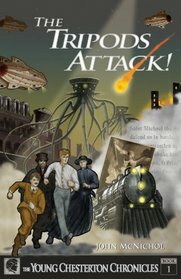 John is a Middle School teacher by trade, and continues to pursue excellence in his vocation while writing steampunk-themed science fiction about his favorite authors and literary characters. John loves loaded pizzas, meaty lasagnas, killing 3-5 hours at a stretch at his local Barnes & Noble on the weekend and seeing fan art based on his works. He hates broccoli. Hates it. Still. Graduated in 1992 from the Franciscan University of Steubenville with a degree in Mental Health and Human Services and a minor in Theology. 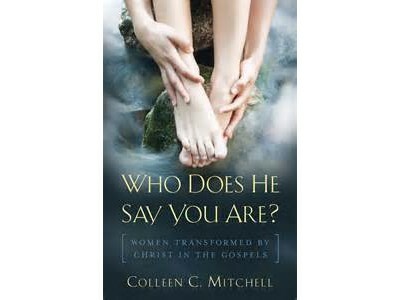 Book Review: Who Does He Say You Are?